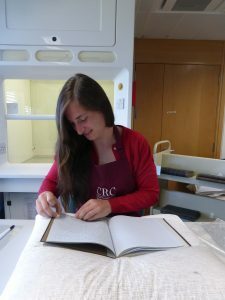 My name is Claire and I am a conservation student from Northumbria University, specialising in paper conservation. This is the first of several voluntary work placements I must carry out as part of my Master’s degree. Working at the conservation studio the past two weeks has challenged me to work with new materials outside of my specialism. 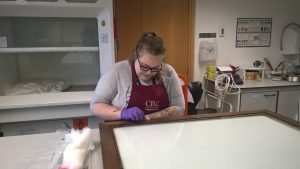 In this week’s blog, we interview a conservation volunteer to find out what they do in the studio and the benefits of volunteering…. 3. What do you do when you are not volunteering? Despite currently being swamped in dissertation research for the MSc in Book History and Material Culture, I love to go hiking in the Scottish hills and highlands, hunting for castles or other medieval vestiges on my bike, or simply reading a book or knitting. Session Paper Project Internship | To Protect and (Con)serve on The Good, the Fair and the Unusable. Conservation of Session Papers at the CRC.